The Ranger and Bronco will return to the Ford stable. The Ranger will come back to North America in 2019, and the Bronco will be brought back in 2020 and sell globally. Both will be produced at the Michigan Assembly Plant. Ford discontinued the Ranger, a small truck, in 2011, but newer versions are sold in 180 markets around the world. They currently are built in Argentina, South Africa, Thailand and Nigeria. The Bronco, which drew national attention as the getaway vehicle for O.J. Simpson, was discontinued in 1996 after being built for 30 years at Ford’s plant in Wayne. Its successor, the Expedition, was also built in Wayne before moving to Kentucky Truck. Ford showed a Bronco concept at the 2004 North American International Auto Show in Detroit. Ahead of its Monday auto show reveal, the automaker announced Sunday a refreshed F-150 that it will bring to market. The new pickup ditches the three-bar grille that has been Ford’s signature design for over a decade, and brings a diesel engine to the light-duty truck lineup (previously offered only in heavy duty) for the first time in its nearly 70-year history. 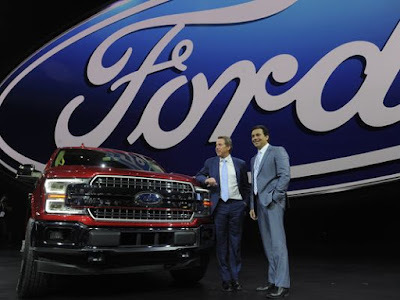 Ford crested the 800,000 sales bar for the first time since 2005, leading truck market sales with the F-150 and its new for 2016 F-250 Super Duty brother. The Ford beat out its biggest competitor — the Chevy Silverado by over 250,000 units sold, and it beat General Motors’ Silverado/GMC Sierra twins by about 24,000. The 2018 F-150 is due in showrooms in the fall 2017, but the diesel version won’t be available until the summer 2018. Built in England by Ford, the diesel will deliver impressive towing ability and is the same oil-burner found in Land Rover’s SUVs.